Posted on 24, May 2016 by EuropaWire PR Editors | This entry was posted in Education, Science, Technology, United Kingdom and tagged Cryoprotectant molecules, Dr Lorna Dougan, glycerol, University of Leeds. Bookmark the permalink. LEEDS, 24-May-2016 — /EuropaWire/ — Researchers from the University of Leeds have taken an important step forward in mimicking nature’s prowess at protecting cells from deep-freeze conditions. The new research, published today in the print edition of the Journal of Physical Chemistry B, reveals how glycerol prevents ice crystals from forming in water as the solution is cooled to -35°C, with important implications for improving cryoprotectants used in fertility treatments and food storage. Dr Lorna Dougan from the University’s School of Physics and Astronomy, who leads the research group, said: “The experiments provide more insight into the fundamental properties of water. It raises questions about what cryoprotectants are doing in living organisms and could help us take steps to understanding how these organisms survive. Cryoprotectant molecules, including glycerol, play an important role in protecting cells and tissues from harmful ice crystals when they are cooled to sub-zero temperatures during freeze storage. 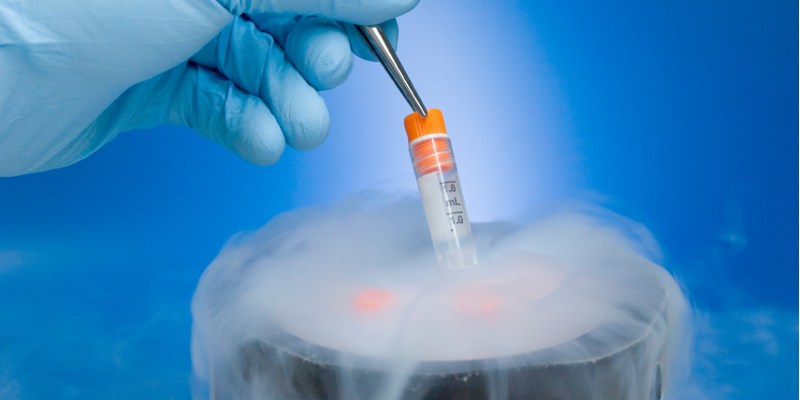 Experts have adopted the use of cryoprotectants in fertility treatments and food storage, but not as effectively as in nature. It is the ability of organisms that can survive in extreme cold environments – known as ‘psychrophiles’ – that inspired the team of physicists to unpick the biological rules that allow their survival. In winter months, for example, the Eastern Wood frog in North America survives being frozen to temperatures as low as -8°C for weeks, and then in spring thaws out and continues to live perfectly healthily. To understand how reptiles like the Eastern Wood frog can freeze and thaw, the team used a Science and Technology Facilities Council (STFC) instrument called SANDALS that was purpose-built for investigating the structure of liquids and amorphous materials. They wanted to answer the fundamental question of how cryoprotectants alter the structure of water at low temperatures, as it is the water structure that is so important in leading to potential ice damage. The SANDALS instrument allowed the team to see, at the molecular level, that the water and glycerol segregated into clusters. When they looked in more detail, they found the water looked similar to a low density form of itself, showing all the signs it was about to freeze but then it did not. Instead, the glycerol molecules encapsulated the water, preventing the formation of an icy network. The team will now use these results as a platform for discovering the next generation of cryoprotectants. The SANDALS instrument is based at the ISIS Neutron and Muon Source. The research was supported by funding from the European Research Council on a grant to Dr Dougan on ‘Extreme Biophysics’. The Engineering and Physical Sciences Research Council (EPSRC) funded first author of the paper Dr James Towey on a PhD studentship. The research paper, ‘Low-Density Water Structure Observed in a Nanosegregated Cryoprotectant Solution at Low Temperatures from 285 to 238 K’, is published in the Journal of Physical Chemistry B.
Dr Lorna Dougan is available for interview. Please contact Sarah Reed in the University’s Media Relations team on s.j.reed@leeds.ac.uk or 0113 343 4196.